In my quest to discover the truth and beauty found in the study of mathematics, I found something that I never realized had been lost: the presence of God. I confess that I never once felt the presence of the Lord above when I cracked open my Algebra textbook in high school. In fact, the angst I felt in my college physics class felt more like it came from the depths of hell than from the mind of the Creator! Yet, come the Lord did, as I prayed and searched and asked Him to show me himself in the dry, utilitarian, uncreative, headache-inducing subject of math. One of the resources provided to me in my study was the esoteric book, Beauty for Truth’s Sake, by Stratford Caldecott. In this book I first glimpsed a glimmer of art within the discipline of mathematics. Math has Divine Origins. As I researched and searched for beauty in this body of knowledge called math, I re-discovered a principle that was only touched on when I took an art history class in college. It was never taught to me in school — or, if it was, it wasn’t in such a way that I would remember. Leonardo Fibonacci, born in Pisa, Italy in 1170, introduced Arabic numbers to Europe and developed a sequence of numbers that now bear his name. He posed a word problem about multiplying rabbits. If you suppose that after becoming two months old, a female rabbit will give birth to exactly one female rabbit every month, and her offspring will begin giving birth in the same way after two months, how many rabbits will there be at the end of a year, assuming no rabbits escape or die? The answer to his question makes up what is called the Fibonacci Sequence: 1, 1, 2, 3, 5, 8, 13, 21, and so on. Notice that the sum of the previous two Fibonacci numbers gives the next Fibonacci number. The things which are seen…were not made of things which are visible. And He who created the very structures on which mathematics operates is fully capable of equipping me to effectively teach myself that which has been lost through the ages of public school math instruction, at least on me…an appreciation for and interest in how this underlying structure works. Opening my eyes to the truth of Who created the structure has given me keys to understanding that structure, or, if not yet understanding, then a desire to seek out and be educated. 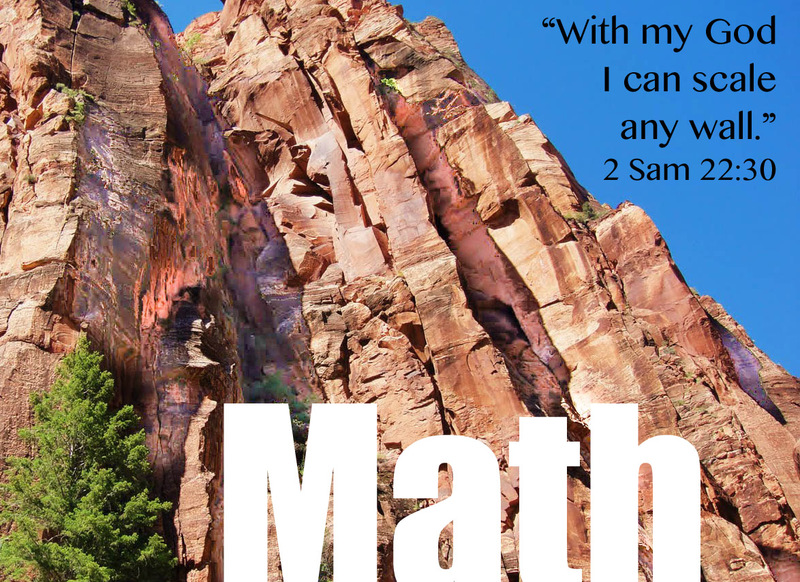 With God’s help, I can scale any wall…even those composed of decimals, complex fractions, and quadratic equations. And so, too, can you!